The RTI team makes their picks for the No. 5 Vols’ match-up with Mississippi State on Senior Night. Managing editor Nathanael Rutherford and staff writer Ben McKee share their predictions for Tuesday night’s game. 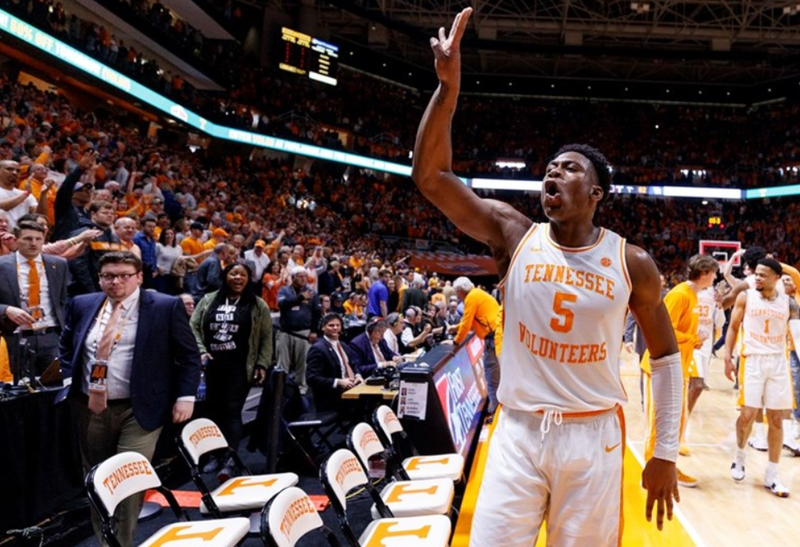 The Vols have to be wary of two things on Tuesday night: Having an emotional hangover from their big win over Kentucky and playing too emotional because of Senior Night. If Tennessee can keep their emotions from getting the better of them, they should be able to preserve their perfect record at home this season. Mississippi State is a dangerous team, and there’s a reason they were ranked in the top 25 of the AP Poll for most of the season. They’re an impressive team that can beat you with their offense just as easily as they can with their defense. They aren’t as efficient as the Vols can be on either end of the court, but they have a good overall team that’s spearheaded by two veteran guards. Quinndary Weatherspoon is a First Team All-SEC performer right now, and he’ll be Tennessee’s No. 1 priority on defense. He’s averaging 18.8 points per game and is averaging an SEC-best 19.8 points per game in conference games. The senior guard has been dangerous all season, and the Vols must keep him from going off on Tuesday night. The Bulldogs’ offense is managed by junior point guard Lamar Peters. On the season, Peters is averaging 11.3 points and 5.3 assists. He’s been effective and hasn’t let Mississippi State’s offense stagnate too often this year. Throw in the fact that Tyson Carter has been electric in his starting role over the last five games, and Mississippi State has plenty for UT to worry about. But like I said before, if the Vols can keep their emotions from controlling them, they should win. They’re the better team from top to bottom, and the Vols haven’t lost to a clearly inferior opponent all season. I expect Tennessee to keep that defensive intensity they showed against Kentucky, and Mississippi State isn’t exactly a dominating post team like Kentucky has shown they can be or that LSU can sometimes be. The Bulldogs are a good team, but they don’t match up all that great with the Vols. They certainly are capable of winning, but I think UT has the advantage in this one. Last season, Schofield went off on Mississippi State when these two teams played in the regular season, totaling 24 points and seven rebounds on 9-of-18 shooting. He didn’t play quite as well against the Bulldogs in the SEC Tournament, getting just 13 points and eight rebounds, but I just don’t think the Bulldogs have anyone who really matches up well with him defensively. The only person I could see maybe guarding him is freshman Robert Woodard, but he’ll likely have to guard Grant Williams at times. Everyone else is a bad match-up on him for Mississippi State. Tuesday marks the beginning of a big week of basketball for the Baller Vols. If Tennessee takes cares of business and beats Mississippi State on Tuesday night and then beats Auburn on Saturday afternoon, the Vols are guaranteed at least a share of the SEC title. Throw in an LSU loss to Florida on Wednesday or a loss to Vanderbilt on Saturday, and Tennessee wins the SEC crown outright. Should the Vols win the SEC outright, they’ll be the No. 1 seed in the SEC Tournament and will avoid LSU and Kentucky until the SEC Championship Game. In addition to everything that’s on the line within the conference, Tennessee is playing for a No. 1 seed in the NCAA Tournament as well. But first things first, the Vols have to handle business against Mississippi State on Senior Night. Looking to play spoiler, the Bulldogs also have a lot on the line, as they’re playing for a double-bye in the SEC Tournament. As senior guard Quinndary Weatherspoon goes, Mississippi State goes. Weatherspoon is averaging 18.8 points per game and will be an easy selection to the All-SEC First Team once the season ends. That’s not to say Weatherspoon is the only weapon the Bulldogs have, though. Mississippi State has a veteran point guard in Lamar Peters, who will be a fun match-up for Jordan Bone. State’s Tyson Carter can light it up from the 3-point line, which creates a huge emphasis on Jordan Bowden and Lamonte Turner defensively. In the paint, Grant Williams and Kyle Alexander will be matched up with freshman Reggie Perry and Abdul Ado. As a freshman, Perry has been terrific this season and will likely match-up with Alexander as Ado draws the responsibility of guarding Williams. Though Ado is viewed as a much better defensive player than an offensive player, this is an advantageous match-up for Williams. But the match-up I’m looking forward to the most and the one that I believe will be the difference in the game is who for Mississippi State is going to defend Admiral Schofield. On paper, the Bulldogs don’t have a player that is capable of matching Schofield’s physicality. At the end of the day, I think Tennessee wins a close one. Mississippi State is a much better team than people realize, and should there be a hangover from the emotional win over Kentucky for the Vols, the Bulldogs could absolutely steal one on senior night. I’m trusting that Tennessee’s experience will help them get past State, because quite frankly, the Vols are better from top-to-bottom. I go back to Admiral Schofield’s match-up. Who for Mississippi State is going to defend the Vols’ senior? Last season in Starkville, Ben Howland assigned Aric Holman the responsibility and he got absolutely cooked. On paper, I don’t see anyone that can match Schofield’s physicality. When you factor in that it’s going to be senior night and he’ll want to go out with a bang, I expect Schofield to have a big night.